A report from the 2016 Blair Center Poll, prepared by Xavier Medina Vidal, Ph.D.
As Americans await to see the degree to which President Trump will follow through on the many promises made by candidate Trump regarding policy, the Diane D. Blair Center of Southern Politics and Society at the University of Arkansas presents findings from its 2016 Blair Center Poll (BCP). Unlike national election prediction polls, the Blair Center Poll’s unique design and implementation explores – in depth – the cultural and ideological questions that best develop our understanding of the national political climate at the beginning of a new administration. Do Americans want to construct a wall between the U.S. and Mexico? Who agrees that there ought to be a pathway to citizenship for undocumented immigrants? Are feelings about immigrants and immigration policy “a race thing?” In our first 2016 poll report we present evidence of polarized opinion on immigration policy proposals among southerners and non-southerners, Trump supporters and Clinton supporters, and of the racialization of immigrants and Latinos. We go beyond campaign rhetoric to examine how divided US society is on its views toward immigration policies. In this report, we examine the views of white, African American, and Latina/o Americans toward the immigration politics and policy issues that became central to the 2016 general election. Building from the successes of the 2010 and 2012 Blair Center Polls, the 2016 Blair Center Poll, conducted in the days following the 2016 general election, asked a series policy- and identity-related questions of a national sample of 3,668 respondents. Of the sample, 1,021 respondents were Latina/o, 915 were African American, and 1,732 were non-Hispanic white. The sample also included 1,828 participants living in the geographic south, defined here as the 11 states that formed the Confederate States of America. A wall should be built along the entire border with Mexico. Undocumented immigrants living in the U.S. should be able to remain in the U.S. to become citizens after meeting certain requirements over time. Summary-level findings of the Blair Center Poll noting differences in opinion along ethno-racial and regional lines, and between Donald Trump and Hillary Clinton general election supporters, are reported below. Who wants to build a wall along the border with Mexico? The construction of a wall between the U.S. and Mexico crystalized Donald Trump’s approach to addressing U.S. immigration policy by divisive means. But how divided or unified is U.S. society regarding building such a wall? Figure 1 illustrates the level of public support for the construction of a wall along the entire U.S. border with Mexico among whites (n=1,705), African Americans (n=890) and Latinas/os (n=997). 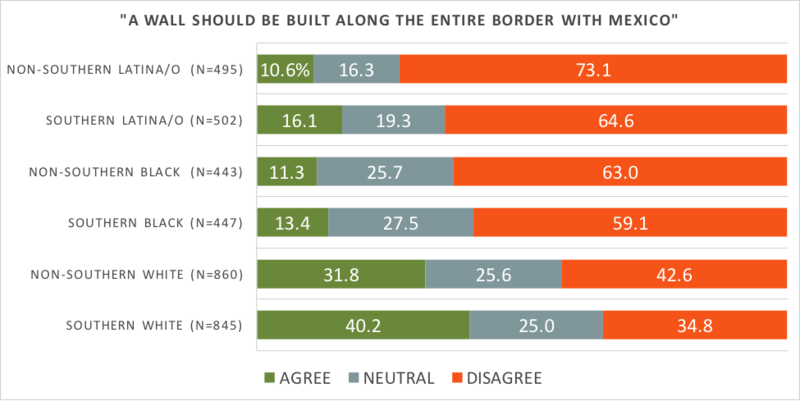 Opinion on the construction of a border wall is most sharply divided along racial lines. There are differences in opinion on this question between white and non-white respondents. White Americans are at least three times more likely than African Americans and Latinos to agree with the construction of a border wall, southern whites being the group with the highest level of support for a wall (40.2%). The distribution of support for/opposition to a border wall among white southerners is approximately the inverse of the distribution among non-southern whites, 42.6% of whom oppose the border wall. Non-southern Latinos are overwhelmingly against (73.1%) the idea of constructing a border wall, followed by southern Latinos (64.6%), non-southern African Americans (63.0%), and southern African Americans (59.1). Latinos, both southern and non-southern, are also the least ambivalent/neutral about the issue. However, the pattern of stronger support for a border wall is consistent across the three ethno-racial groups. In fact, southern Latinos are more supportive (16.1%) of a border wall than non-southern Latinos and both subgroups of African Americans. Given the higher level of neutrality among southern Latinos (19.3%) versus non-southern Latinos (16.3%), one of several possible explanations for southern Latinos’ higher level of support of a border wall is that southern Latinos, like many southerners generally, are more conservative than non-southern Latinos and their policy views are influenced by this ideology. The BCP’s national sample includes 955 individuals reporting they voted for Donald Trump and 1,598 respondents indicating that they voted for Hillary Clinton in the 2016 general election1. Figures 2 and 3 report the distribution of agreement with the construction of a border wall among Trump and Clinton supporters. Among all Trump supporters (Figure 2), the average level of agreement that a border wall should be constructed is 55.5%. Note that only 2.9% of African Americans and 10.5% of Latinos supported Trump, compared to 45.0% support for Trump among white respondents. White Trump supporters (n=811) are more supportive of building a border wall than either Latino or African American Trump supporters. In comparing Hillary Clinton supporters from all three ethno-racial groups (Figure 3), we find very high levels of opposition to the idea of building a border wall and lower levels of neutrality/ambivalence compared to Trump supporters. Clinton supporters of all three ethno-racial groups are soundly opposed to a border wall. 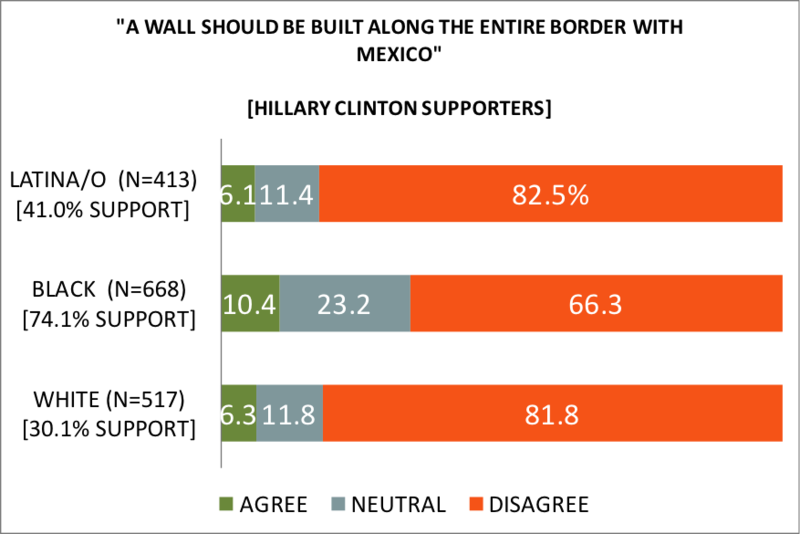 Only about 6% of white and Latino Clinton supporters like the idea of a building a wall, while 10.4% of African American Clinton supporters agree that a wall should be built. Though African Americans are the ethno-racial group expressing the strongest enthusiasm for Clinton (74.1%) and are still in strong opposition to a border wall (66.3%), they are also the most ambivalent/neutral toward the issue (23.2%). Given the higher likelihood of personal issue saliency to Latinos, it is reasonable for Latino Clinton supporters to express the least amount of neutrality (11.4%) to the issue. Should there be a pathway to citizenship for undocumented immigrants? The question of a pathway to citizenship for undocumented immigrants living and working in the U.S. is a much longer established policy proposal than a wall along the U.S.’s southern border. This issue has been taken up by Congress, the President and presidential candidates for more than just the 2016 presidential election cycle. Figure 4 illustrates levels of agreement with a policy of a pathway to citizenship for undocumented immigrants, again reported by region and ethno-racial group. In terms of region, we again see differences in opinion between southerners and non-southerners of all ethno-racial groups. Generally, these differences are rather muted compared to the regional split on the border wall question. Latino newcomers to southern U.S. politics are strongly motivated by immigration policy and face significant challenges as they incorporate politically into new southern immigration destination states. Still, the largest regional opinion gap is between southern and non-southern whites. Southern whites are the group with the highest level of disagreement with a pathway to citizenship issue (32.6%), compared to non-southern whites (28.7%). 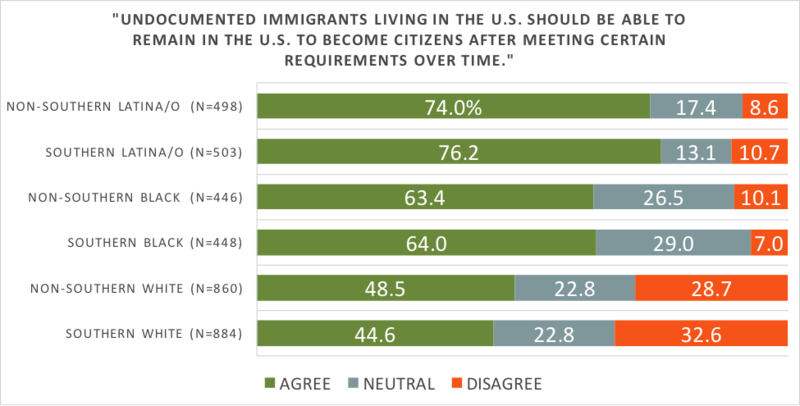 As with the border wall issue, Latinos have the lowest level of ambivalence/neutrality toward the pathway to citizenship question and African Americans are the most ambivalent. The largest overall opinion gap on the question of a pathway to citizenship is between Latino southerners and white southerners. Support for a pathway to citizenship among southern Latinos (76.2%) is the highest among all subgroups, and support among southern whites (44.6%) is the lowest. This 32-percetange-point gap in agreement that there ought to be a pathway to citizenship for undocumented immigrants provides important evidence that Latino newcomers to southern U.S. politics are strongly motivated by immigration policy and face significant challenges as they incorporate politically into new southern immigration destination states2. Figures 5 and 6 illustrate opinion on a pathway to citizenship divided between Trump and Clinton supporters. White Trump supporters nationally express the most opposition to a pathway to citizenship (45.0%) among all groups, including southern whites (32.6% in Figure 4). 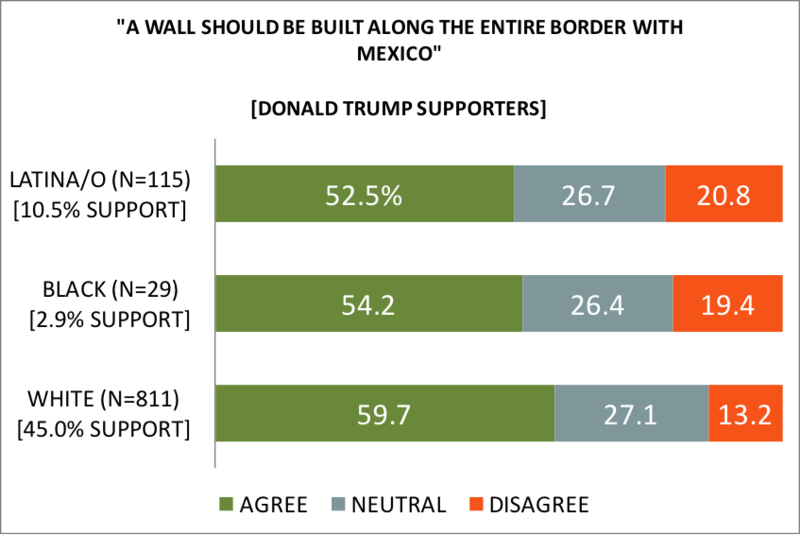 Although opinion on building a border wall was relatively consistent among Latino and white Trump supporters, when asked about the pathway to citizenship for undocumented immigrants, Latino Trump supporters deviate sharply from white Trump supporters. 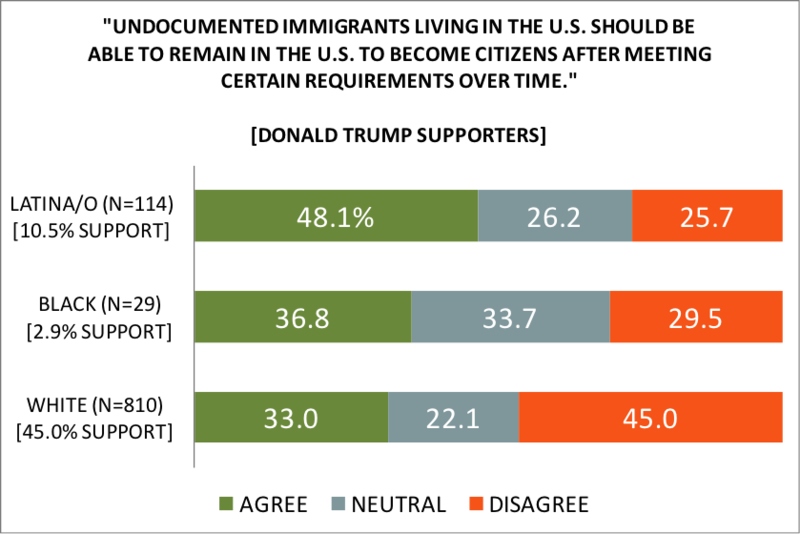 Among Latino supporters of Donald Trump, nearly half (48.1%) agree that there should be a pathway to citizenship, which is over 15 percentage points higher than white Trump supporter agreement. Such an inconsistency among Latino Trump supporters is likely a function of a higher level of issue saliency for a pathway to citizenship among this group. Though only 2.9% of our sample are African American Trump supporters, this group is close-to-evenly divided between agreement, neutrality and disagreement on a pathway to citizenship. Among Hillary Clinton supporters we see a pattern of opinion on a pathway to citizenship (Figure 6) consistent with opinion on the construction of a border wall (Figure 3). African American Clinton supporters are the most ambivalent and least supportive of this policy, though still 67.6% agree that there should be a pathway to citizenship. White Clinton supporters express the most opposition (9.2%) while still a large majority of this group (77.5%) endorse a pathway to citizenship. 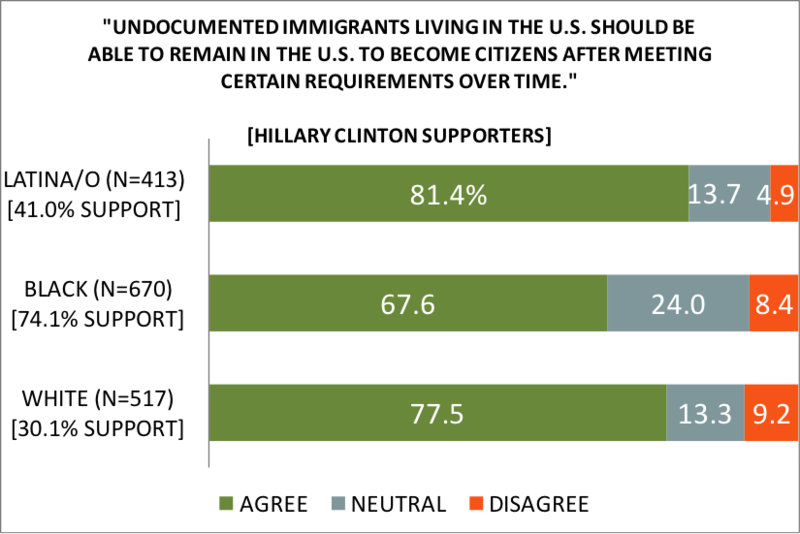 For Latino Clinton supporters, there is slightly more neutrality/ambivalence toward the pathway to citizenship (13.7%) than to the border wall (11.4%), yet still 81.4% of Latino Clinton supporters are in favor of a pathway to citizenship for undocumented immigrants. Anti-immigrant policy positions: Is it a race thing? To be sure, the racialization of Latinos and of immigrant politics were near the center of U.S. politics long before the 2016 presidential race. In the post-1965 protest era of race and ethnic politics, immigrant “newcomers” seeking to become full members of political communities have faced challenges from U.S.-born African Americans, Latinos and Asian Americans who feel that their own political incorporation is incomplete and that immigrant newcomers threaten their own tentative status 3. One of the consequences of this phenomenon is the racialization of immigration politics 4, which leads us to question whether opinion on a pathway to citizenship for undocumented immigrants and on the construction of a border wall are somehow related to public perceptions about how much attention is paid to race and racial issues. 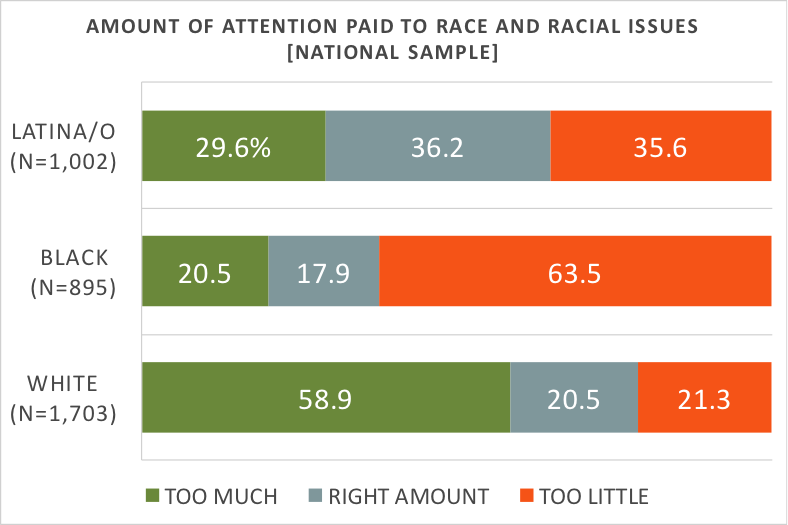 Figure 7 illustrates how white, black and Latino respondents to the 2016 BCP assess whether we as a society pay too much, the right amount, or too little attention to race and racial issues. We see that opinion is most sharply divided among African Americans and whites on this question, with almost an inverse distribution of opinion between these two groups. Among African Americans, 63.5% believe that there is too little attention paid to race and racial issues, while 58.9% of whites believe just the opposite – that too much attention is paid to these issues. Latino opinion, however, is nearly evenly divided into thirds on this question, with 36.2% believing that just the right amount of attention is paid to race and racial issues. With African Americans’ and whites’ polarized views and Latinos’ more evenly distributed views toward attention to race in mind, it becomes important to look more closely at the relationship between opinion about attention to race and opinion about the two immigration policy issues. Tables 1 and 2, which report the correlations between agreement on these two immigration policy-related questions and attitudes about attention paid to race, offer a first glance at this relationship. To simplify this analysis, I report opinion on the two immigration policy questions to reflect pro-Latino/pro-immigrant views below. In Table 1 we observe correlations between opposition to the construction of a border wall and views toward the amount of attention paid to race and racial issues. The strongest correlations are those related to the opinion of white respondents. The belief that we pay too much attention to race is negatively correlated with support for the construction of a border wall at -0.38** for white respondents, compared to -0.15** for African Americans and -0.20** for Latinos. This same pattern holds for respondents’ positive associations between the idea that we pay too little attention to race and support for building a border wall, with white opinion on these two questions most strongly correlated at 0.36**. In Table 2 we observe among all three groups a negative correlation between the view that we pay too much attention to race and agreement that there ought to be a pathway to citizenship for undocumented immigrants. The strongest negative correlation, -0.29**, is among white respondents, and the weakest, -0.06*, is among African Americans. Latino opinion on support for a pathway to citizenship and the notion that we pay too much attention to race is negatively correlated at a level, -0.13**. The inverse, a positive correlation between support for a pathway to citizenship and agreement that we pay too little attention to race, is true for all groups. Again, the strongest positive correlation between these views, 0.28**, is among white respondents. We have a basis from which to argue that white Americans consistently hold opinions that support the racialization of Latino immigrants and xenophobia targets Latinos. These correlations provide preliminary evidence of the racialization of immigration politics and of Latinos among white Americans by illustrating stronger negative relationships between pro-immigrant and pro-Latino policy positions and the view that too much attention is paid to race and racial issues. The correlations between opinion about attention to race and racial issues and the two immigration policy questions suggest that there is indeed a relationship between immigrants and race in the minds of white Americans. Relative to African Americans and Latinos, white Americans draw much stronger associations between race and Latino immigration and immigrants. Because this evidence is based on correlation, we cannot say definitively that an opinion about attention to race is the cause of immigration policy preferences or vice versa. Yet, we have a basis from which to argue that white Americans consistently hold opinions that support the racialization of Latino immigrants and xenophobia targets Latinos. Further in-depth research on this relationship will explore these and other questions related to the racialization of immigrants and immigration policy. Compared to previous election cycles, Latinos and immigrants played a prominent role in the 2016 general election cycle. However, Latinos’ prominence was not directly attributed to their growing political clout and their potential to decide the outcome of the election as a voting bloc. Instead, Mexicans, Latinos generally, and immigrants were thrust into the campaign by way of their relationship to important public policy proposals. A regional divide in the U.S. along these policy issues is also prevalent; white southerners deviate most sharply from the views of non-southerners, Latinos and African Americans in their views toward immigration politics and policy. By significant margins, white Trump supporters hold the strongest anti-Latino and anti-immigrant views. The southern distinctiveness of white opinions on Latinos and immigrants is consistent with research on the consequences of Latino migration into the south. Finally, the sharp divisions between Latino, African American and white views concerning how much attention is paid to race in the U.S. and policies that directly affect Latinos reveal that, compared to African Americans and Latinos, white Americans associate Latinos and immigrants with race and racial issues much more strongly. 1 The levels of support among the three ethnoracial groups for each presidential candidate do not add up to 100 percent because a respondent is not a voter (non-citizen Latinos), chose not to answer, or supported a third-party candidate. 3 Schmidt Sr., Ronald, Yvette M. Alex-Assensoh, Andrew L. Aoki, and Rodney E. Hero. 2013. Newcomers, Outsiders, and Insiders: Immigrants and American Racial Politics in the Early Twenty-First Century. Ann Arbor: University of Michigan Press. Chávez, María, Jessica L. Lavariega Monforti, and Melissa R. Michelson. 2015. Living the Dream: New Immigration Politics and the Lives of Undocumented Latino Youth. Boulder: Paradigm Publishers.